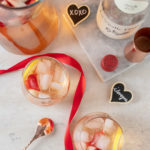 This Rosé Sangria recipe uses dry blush wine and white peach juice to make a rum sangria that is perfect for sipping for Valentine’s Day or as an Anniversary wine sangria. This post contains affiliate links, please see our Site Policies for further information. Recipe is for those ages 21+. It’s birthday week for yours truly. I’m turning 30 this week but before we can get to the birthday fun I have to address the silent elephant in the room. Valentine’s Day. Valentine’s Day is one of those polarizing holidays were you either love or hate it. On top of that, you’re either the Valentine’s Day people who brave the restaurants/crowds or you’re the type that stays at home. Personally, I’m staying at home type. So for you fine lovers of the home, this Valentine’s Day cocktail is for you. 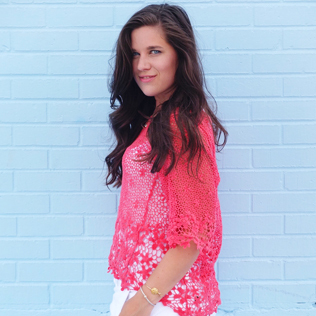 Blushing Rosé Sangria has notes of citrus, peach, and strawberries. I use a dry Rosé to keep a balance of sweetness but if you like to keep things sweeter, then feel free to bump up to a sweet Rosé. 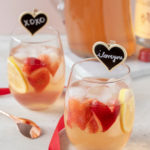 If you want to make things really bubbly you can use Rosé Champagne for a Rosé Champagne Sangria! 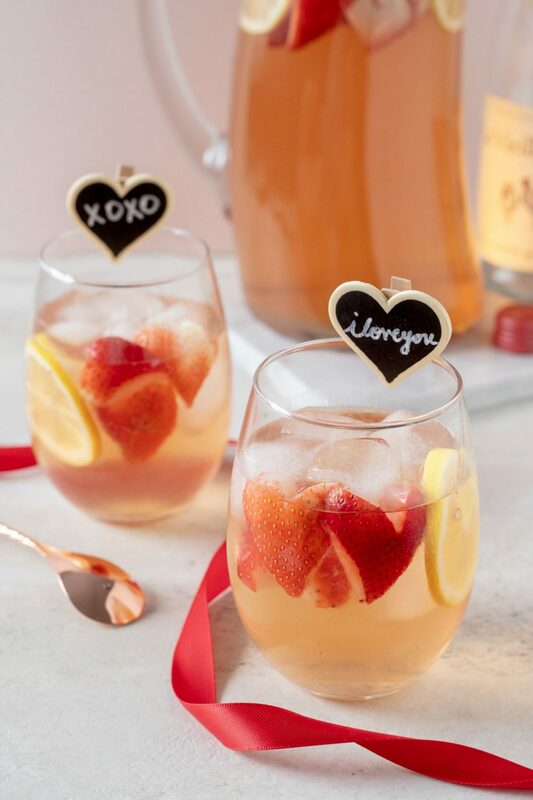 This does make enough Rosé Sangria for a crowd so invite of your favorite couples, cut up some strawberry hearts, and get ready to blush over how bright and tasty this drink is. Sangria is always a winner because it’s delicious and easy to make. About two hours from serving your Sangria throw the following ingredients into a pitcher. Stir it all together until well combined. Let chill in the fridge for 2-4 hours. When ready to service stir in 1-1/2 cups of ginger ale. Serve in a wine glass filled with ice and fruit from the sangria. This yields enough for 8 people. While this is a rum sangria, you could make it a silver tequila sangria or vodka-based sangria. Just keep your spirit clear! 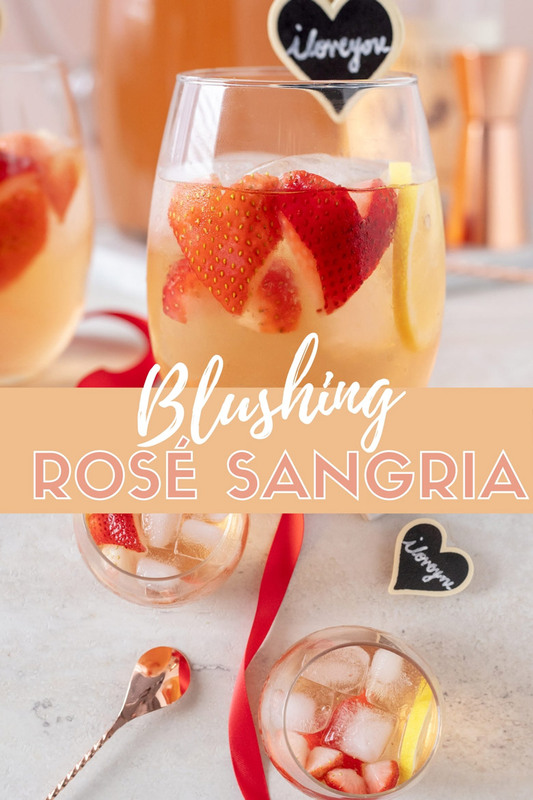 This Rosé Sangria recipe uses dry blush wine and white peach juice to make a rum sangria that is perfect for sipping for Valentine's Day or as an Anniversary wine sangria. Slice your lemon into rounds and throw in a pitcher that can hold 90oz or more. Remove the stem from the strawberries and cut in half. Optional: Cut into heart shapes. Add into the pitcher. 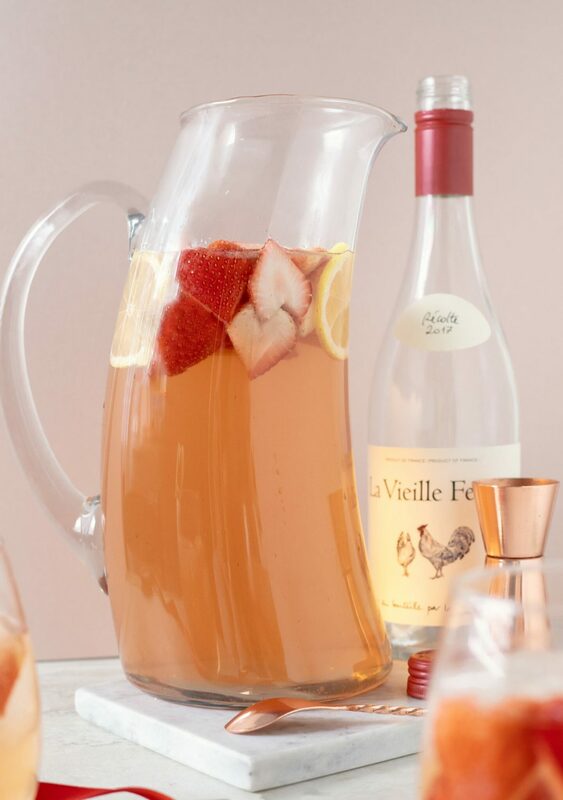 Pour into the pitcher Rosé wine, white rum, Cointreau, white peach juice, and lemon juice. Stir and let sit in the fridge for 2 - 4 hours. The closer to 4 hours the better. 2-4 Hours Later. Remove Sangria from the fridge. Pour in the ginger ale and stir until well combined. Pour into white glasses filled with ice. Top off with fruit from sangria and serve! 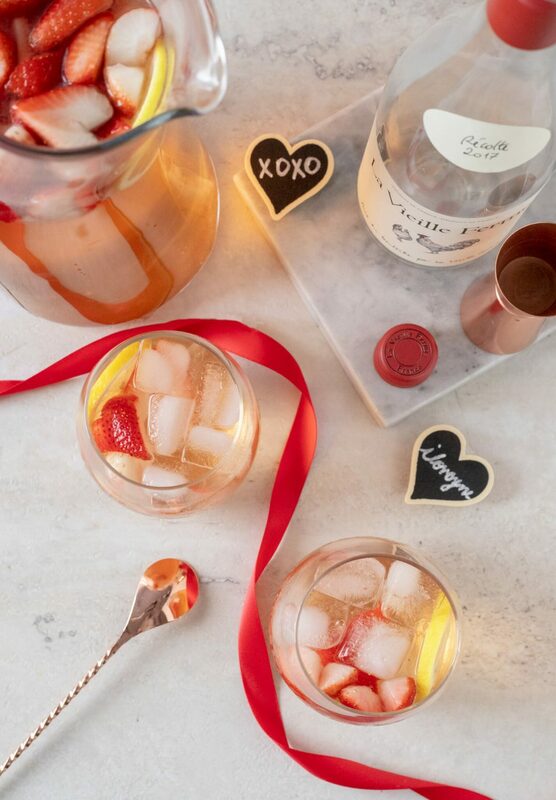 SEE MORE VALENTINE’S DAY RECIPES & COCKTAILS HERE! This stuff is dangerously good! I love how bright it is with the addition of lemon and Cointreau. 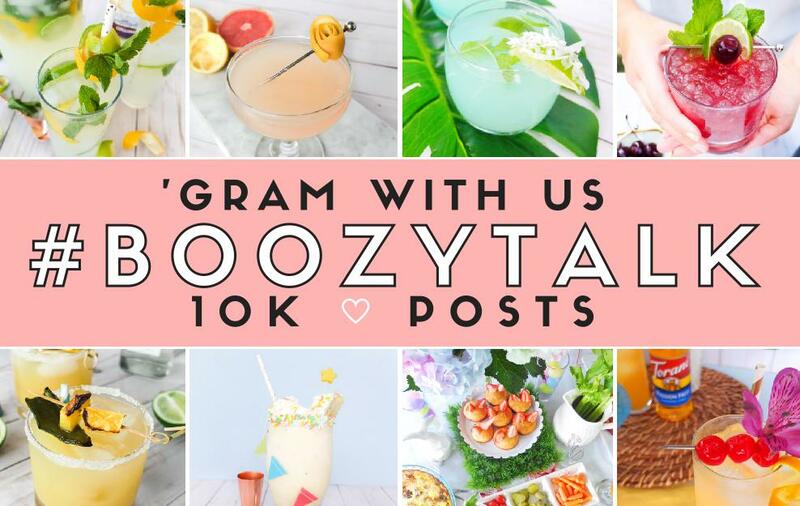 It’s the perfect Valentine’s Day cocktail, though we wouldn’t fault you for making it for bridal showers or just for the heck of it. How are you celebrating Valentine’s Day this year? We’re staying in and cooking center cut pork loin with a good glass of red wine. I hope you have a fantastic Valentine’s Day and I’ll be back later in the week for my birthday!